When I decided to cook this dish, I was sure about three things. 1. Chicken that has been braised in milk is delicious! 2. Dijon mustard and chicken is one flavor combination that totally works. 3. By using my Le Creuset French oven to braise the chicken, the result will be a chicken that is evenly cooked and yet will remain succulent. The first time I was told that I could braise meat in milk, I was totally grossed out. I had this idea that I was going to be eating some strange milk-flavored meat. The truth is that when meat is braised in milk, you do not taste the milk at all. The milk tenderizes the meat and turns into a creamy sauce that is totally delicious! Just try cooking this and you will see exactly what I mean. I made this into a one-pot meal by adding some shallots, mushrooms and baby potatoes. Of course you can choose to cook only the chicken but I take every opportunity to not have to do too much cooking for one meal! Since this is one pot that can easily accommodate the vegetables, they all went in with the chicken! Speaking of cooking pots, my favorite, without a doubt, is this Le Creuset 24cm French oven. It is the prefect size whether you are cooking for 2 or 8, or even more if you are dishing out smaller portions! In addition, it is also big enough to fit a chicken and vegetables for a roast dinner or casserole dish. What I also love about this pot is the fact that I can use it on the induction cooker or stove, as well as the oven. A lot of the time, I cook one-pot meals and it is great when everything can be par-cooked in the pot and the same pot can be placed in the oven for the food to continue cooking. This greatly frees up a lot of my time! Let me show you how to very easily cook a meal for a family of 4!. Heat some olive oil in the Le Creuset French Oven. When the oil is hot, season the chicken with salt and black pepper on all sides then place it onto the oil. Leave the chicken alone and let it cook. When the chicken is ready to be turned, the skin will be released from the bottom of the pan. So don’t poke at it or scrape at it. Have patience! Once the chicken is ready, turn it over and brown the other side. While the chicken is browning, whisk together minced garlic, milk, Dijon mustard, whole grain Dijon mustard and mustard powder. 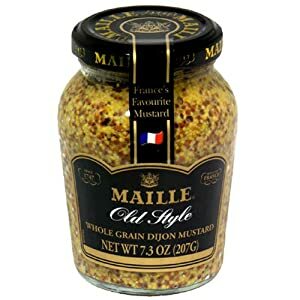 You can also choose to use only Dijon mustard but I like the texture of the whole grain mustard. It may seem like a lot of mustard has been added but don’t worry, it all comes together to form a delicious sauce and it is not overly mustard-y. Add low-sodium chicken stock and mix. If you can’t find low-sodium chicken stock, mix 50% salted chicken stock with 50% water. Once the chicken is brown, transfer it onto a plate. Drain the oil then return the chicken to the same pot. Pour the milk mixture into the pot. Add marjoram (or thyme), fennel seeds and lemon zest. Add the mushrooms. Cook the chicken, uncovered, at 200°C for 30 minutes. Add the shallots and potatoes into the pot and return to the oven. Cook, uncovered, at the same temperature for another 30 minutes, or until the potatoes are tender. It is amazing how tender the chicken is. And the sauce is to die for! Click on the image to see my available cooking and baking workshops! While the chicken is browning, whisk together minced garlic, milk, Dijon mustard, whole grain Dijon mustard and mustard powder. Add low-sodium chicken stock and mix. If you can’t find low-sodium chicken stock, mix 50% salted chicken stock with 50% water. Add marjoram, fennel seeds and lemon zest. Disclaimer: While this post was brought to you by Le Creuset, The Domestic Goddess Wannabe uses her Le Creuset Fench ovens on a very regular basis and hopes that you too, will discover the beauty of cooking with Le Creuset products! Is it possible to cook this dish without Le Creuset French oven? I do not have an oven. Can I replace step 7 by cooking in the pot for 30 minutes? yes you can. low heat and covered ok! Step 8 covered or cook this entire dish uncovered? Hi Joanna no, it is cooked uncovered all the way! Thanks.. did that! This is another winner! Hi Yvonne no, the sauce is not supposed to be very watery as most of the liquid would have evaporated while cooking. Did you cook with lid off? Hmm…I did cook with the lid off. Probably will try it again this time with lesser liquid and see how it goes. You can adjust according to your taste preference. Hi Diana….cooked this yesterday for dinner. It was superb ! But I could not find mustard grain….so had to di without it. Thanks again for sharing. Tried this recipe today and it was delicious! Chicken was flavorful and tender. Mustard was not overpowering at all. In all, a fabulous dish! Tried this recipe and it was delicious! Will this work with chopped chicken pieces instead of whole chicken? Any adjustments to be made if cooking with chicken pieces ?